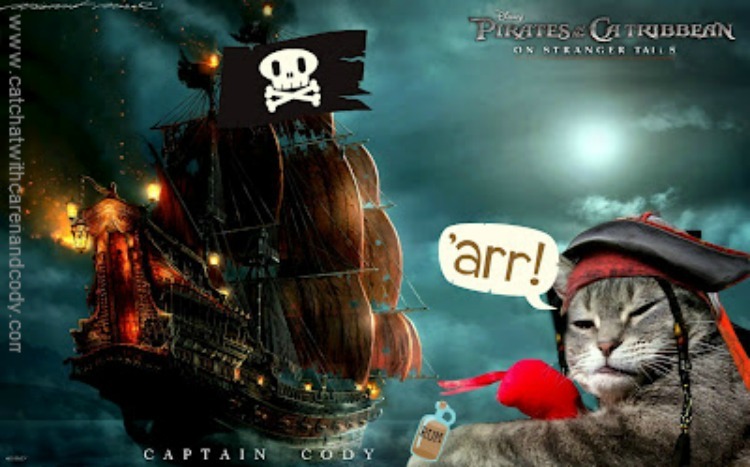 Cat Chat With Caren And Cody: International Talk (Meow) Like A Pirate Day!! International Talk (Meow) Like A Pirate Day!! Ye sure do make a fine pirate, Captain Cody! Happy Meow Like a Pirate Day, hearties! I don't wanna be a pirate! Too bad! Your a great pirate indeed Cody. Arrrgh Cap'n Cody! Terrible Ted the Pirate says HAPPY pillaging and sailing today! Ye make a mighty fine pirate, Captain Cody. Arrgh! Well I’m about to write my blog but I’m not sure I have an eyepatch or a bottle of rum! Cody you make an adorable pirate. Captain Cody, ye look sharper than a dagger in that there hat and ye have a ship that any pirate would give one of their nine lives to own. Arrr! Oh Cody, you are pirate purrfect pal!!! We didn't quite feel up to pirating this year. Cap'n Cody did you have one too many Rum/Niptini mixes? Yes, don't mess with perfection! Wowie, Cody...you scare me right out of my boots! Arrr, ye be a fine pirate, Cap'n Cody. Aye, that there be a fine ship a-splitting the waves matey!~ May yer oars stay dry an yer holds drier! Happy Meow Like a Pirate Day, cutie! Hope you are having a great Meow Like A Pirate Day! Arrrr. Ye be a fine pirate, Cap’n Cody. You make a super adorable and scary pirate! Queen Penelope LOVES that picture of you Cody! I think you make a most magnificent Pirate too! That's an awesome picture! Happy Pirate Day! Happy sailin' to ye all, and to ye all, have ye a Yo Ho Ho and bottle o' nip on us, Arrr! You are one handsome pirate, Cody! That is THE most epic picture ever!! You do look a bit ... err ... well watered in that graphic. We hope it was fun! Oooohhh, Captain Cody, you sure do make one scary pirate! Fantastic artwork. You are a fine-looking pirate, Cody!